In past generations, Angelo would have been killed at birth. Born out of wedlock, he is considered ‘cursed’ and therefore a curse to his family. While most tribal Africans no longer murder babies born to unwed mothers, the stigma still remains. These babies are still called ‘cursed’ children. Angelo’s father and his tribe still practice the old ways. Shamed by the birth of this ‘cursed’ child, he decided to end the baby’s life. There are two ways this death can be accomplished. The first way is to lay the newborn infant on the threshold of a cow pen. The opening to the pen is only wide enough for one cow at a time. Then, the cows are whipped into a frenzy and forced to leave the pen. In their stressed state, the cows will panic and trample the baby in their effort to get out of the pen. The second traditional way to kill a ‘cursed’ child is by using poison. There is a long history in Maasai culture of specialist trained midwifes who help in the delivery of babies. The Maasai men wait outside the hut as the baby is born while the women assist. The midwifes are trained in the use of medicines. They have medicines that help life and medicines that end life, if needed. A ‘cursed’ child was one of those reasons for ending the life of the baby. Angelo’s father paid the midwife who assisted in the birth to also poison the baby. Because Angelo’s mother didn’t practice the old ways, the poisoning was done without her knowledge. The poison entered the newborn’s bloodstream and began it’s evil work. Amazingly, Angelo didn’t die. But the poison damaged the little boy’s mind. He would often drop into unconsciousness and have seizures which caused his little body to shake uncontrollably. The weight of having a ‘cursed’ baby who was also now fitting and inconsolable caused his mother to look for a way out. To protect the baby and herself, she sent little Angelo to live with her older brother’s family. Angelo’s uncle kept him for a year and then sold him to a rich man who said he would help Angelo. Instead, Angelo was left outside with the animals. Angelo spent the next four years of his life, until he was five years old living and eating with the the rich man’s livestock. Maasai boys often look after the livestock. The rich man had sons but had sent them all off to private boarding school. Because he lived in a secluded place with his own water source and grazing area, the rich man did not fear other Maasai children seeing the boy at watering holes or in the fields. Angelo was the alone with the animals and the occasional interaction with the rich man’s family. It was the only life Angelo knew. Joseph has a network of informants he calls ‘ladies under the ground’ who subtlety infiltrate suspected situations. Mobile phones have made these types of rescues all the more possible. The stories spread quickly and when the stories get to Joseph’s informers, they call him. Upon hearing the story of Angelo, Joseph went to the sight to see if the story was true. Getting to the boy was not easy. Joseph had to walk in at night to avoid the attention of the rich man. And then he had to find the boy. The place where the rich man lived, like many Maasai homes, had no roads. The Maasai are great walkers. They will walk amazing distances and think nothing of it. Scientists have studied the Maasai metabolism and circulatory system and are convinced that the hundreds of generations of Maasai herders who walk all day long for their entire lives has made them a truly unique people. They walk faster and further than most other people groups could even imagine. Joseph decided he would need to walk through the jungle to get to little Angelo undetected. This meant he would be walking through the territory of lion, cheetah and elephant. So as he entered the jungle, Joseph found a giraffe and encouraged it to head the direction he needed to go. Maasai have long used Girafee as their guides at night in dangerous areas. A girafee will not knowingly walk near dangerous animals. For the entire 47 kilometre journey, Joseph shepherded the giraffe who smelled their way through the jungle and arrived safely on the other side well before morning. After searching for sometime from the edge of the jungle, Joseph found the boy alone hiding in a bush watching the rich man’s cows. The boy was terrified of Joseph, having seen very few people in his life, and would not come out of the bush. Joseph noticed that the boy was wild and difficult to communicate with. Convinced the story was true, Joseph used the weapon of his trade, a mobile phone, to call Leon and Carole Platt in Australia - the Education Care Projects Kenya coordinators who source and provide sponsorship for the children. Without sponsorship, there was no reason to take the boy. 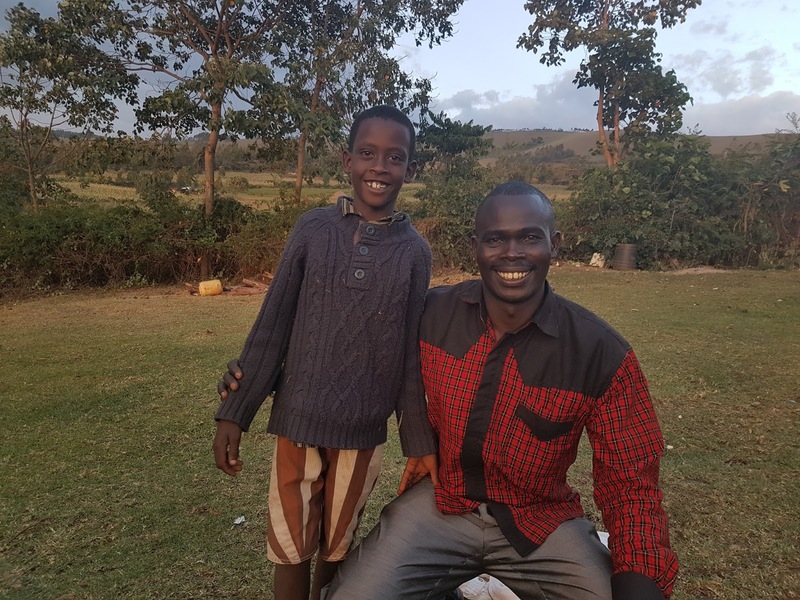 Early in his rescuing work, Joseph, used to attempt to care for children on his own until funding could be found for putting the child into boarding school - the safest place in Kenya for threatened children. But now, well known for his work, Joseph cannot afford to take every child home to join his family of five children. Joseph continued the story of little five year old Angelo. After receiving the call about this urgent rescue, Leon and Carole added little Angelo to the prayer chain at their church in Kingscliff Seventh-day Adventist Church and within hours offers to assist financially were made available. They called Joseph back and he went into action. Joseph made his way back out of the jungle and stayed in a nearby town. Every day, he would talk to his ‘ladies in the ground’ about how he should approach the boy and numerous times he made the trip back through the jungle to visit the wild boy. Finally after two weeks of talking to Angelo, trust was built. He was convinced by Joseph’s stories of a better life where children have food, clothing, education and safety. Angelo agreed to come with Joseph. 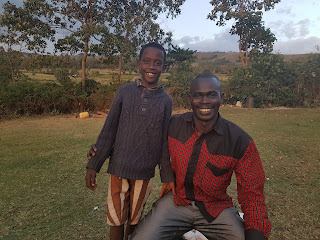 Joseph took Angelo to the Catholic boarding school - the safest school in Maasai land. He paid for clothes, tuition and and food. Angelo had never worn shoes. Never used toilet paper. Never brushed his teeth. Joseph went to school with Angelo. He sat with him every day all day for many days. He helped Angelo do the right thing. He explained how to be a good student and play nice. The little school is being built just over the hill from Joseph’s land in Kapune, Kenya. Leon, a builder by trade, has been leading a team of eager locals to build the school. Each day, Leon feeds his crew lunch and pays them a local day’s wages. Joseph uses the word charity where you and I would use the word mercy. There are a couple of reasons for this. First, it truly takes the charity of people like you and me to make Joseph’s work possible. Second, the word mercy is reserved for one person in Joseph’s life. One person who makes his work, his passion and his heart for children possible. Mercy is the name of Joseph’s wife. If you would like to help bring mercy to children like Angelo, please donate to Education Care Projects Kenya. Every dollar comes to the work here in Kenya. There is no costly organisation taking a cut. It’s just Carole and Leon Platt donating their time and energy - and here in Kapune, Joseph and Mercy changing the world one child at a time.